I updated the Hunter Macros page so that everything is now current with Warlords. I removed all of the obsolete macros with retired abilities – including one I found in there with Wing Clip o.O – and I even added a few new ones that I’m using. Next up… Gar UI update for WoD. I had to reconfigure a few things, remove a couple of addons and add a few new ones, but I’m just about ready to load it up to WoWInterface. I’ll try to have the latest version up on Wednesday, right before launch. Thought I’d go after the unique Hydra skin, but apparently I’m not the only hunter with that idea… Not shown are the 2 additional hunters that were behind me on the map. I’m a little overwhelmed right now trying to get up to speed with the recent patch updates (errr… game overhaul), but just wanted to post a quick note saying I am here and I will be back. How are you enjoying the pre-xpac patch? Been absent from the blog, but I have been poking around in-game. My latest project has been leveling a Warrior alt that’s lay dormant for nearly 7 years. 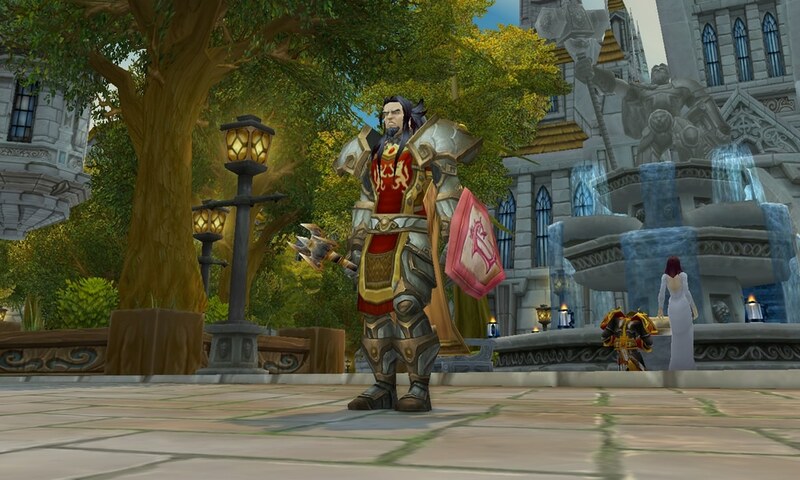 After leveling a Paladin this past year I discovered that I really enjoy tanking (who knew..?! ), so I figured why not dust the Warrior off, throw some heirlooms on him and get him to 90. I love him! Warrior tanks are interesting and fun to play. Apart from huntering in some random BGs and leveling alts, the other thing I’ve enjoyed doing is putting together transmog sets. 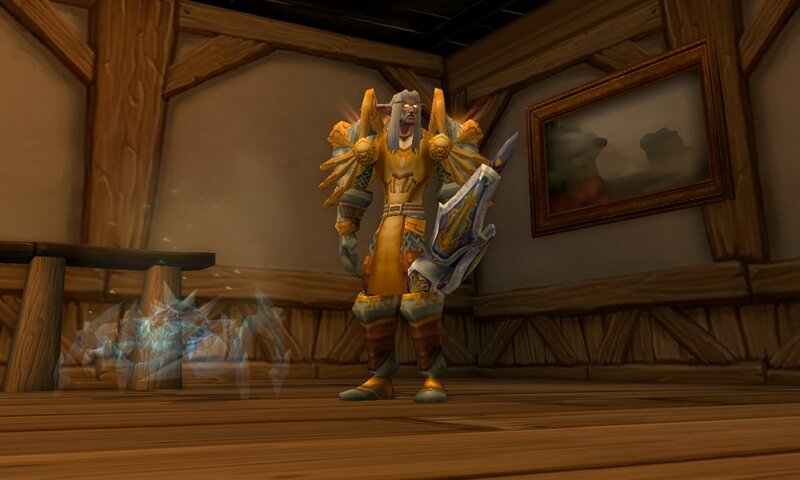 I’m not really that keen on most of the Warrior dungeon sets, and I lean towards more of the classic looks, which is why the Lightforge Recolor set really caught my eye. My choice for shield was the King’s Bulwark. The set pieces are available in normal mode TBC dungeons, so it’s fairly easy to gather up; however, getting some of the pieces to drop for you can be a pain. I was able to gather most of the pieces while leveling through random dungeons, but I had to go back to grab the chest piece and boots. The boots dropped during my first run of The Escape from Durnholde, but I lost the roll to a Ret Pally. After that run it took about 18 more attempts to get them to drop again. Neeedless to say, I’ve had about enough of that dungeon for awhile. This set started when I snagged a cheap pair of Elven Chain Boots from the auction house. I’ve always liked the look of those boots for a hunter, so I went to see if there were any pieces to match. Turns out there are chest and legs that match. To finish off the set I added a couple of pieces of Fel Iron Chain (helm and gloves), some Thick Scale shoulders and a Der’izu belt. Lastly, I finished the set off with a Shrieking Bow. 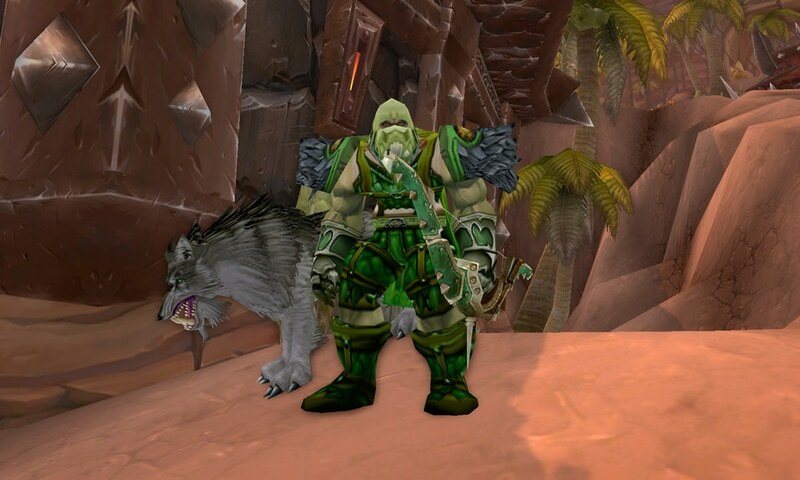 The bow really helps seal the look because it further ties in the shades of green present on the Fel Iron Chain, shoulders and belt. As far as I’m aware, this set is pretty original. I’ve not seen it shown anywhere else, and it definitely came together organically. I more or less scanned the auction house – trying on different greens until I got a look that I liked. I’m pretty happy with it! 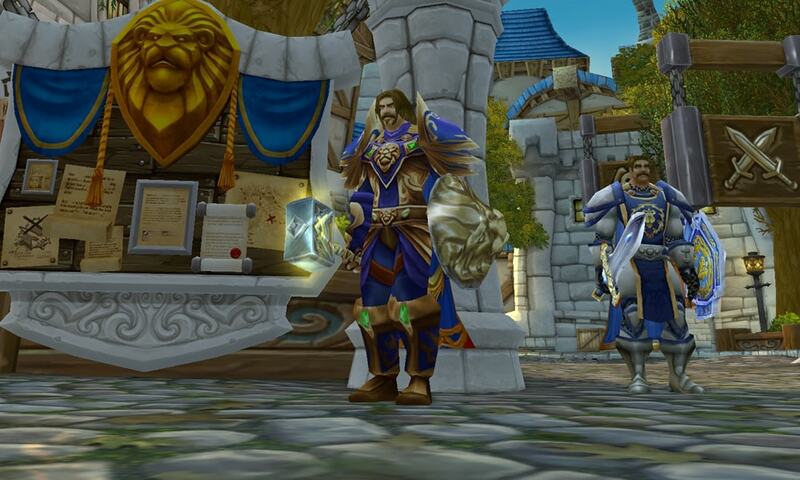 My next mission will be to get my 90 Pally mogged out. He’s sporting a matched set of MoP quest plate, which looks decent, but I’m wanting to deck him out something a bit more fabulous. I’m leaning towards the Judgement Recolor for him. The Orc is always hilarious, but between the hunter and his pet (Frostsaber..? ), those two steal the show in this series – especially in this last one. The Explosive Trap + Disengage was friggin’ great, and the Aspect of the Cheetah emote, but the Scare Beast at the end…OMG. Around 5 years ago, some clever Hunter devised a way to tame a Worgen – back before they were a playable race, of course. Once I got wind of this taming exploit I naturally had to give it a try for myself. I mean, the thought of having a werewolf for a pet…how badass was that..?! In the Howling Fjord there is a quest chain that leads up to the killing of a Worg called Garwal. Once Garwal reaches 50% he shifts out of his Worg form and into a Worgen. 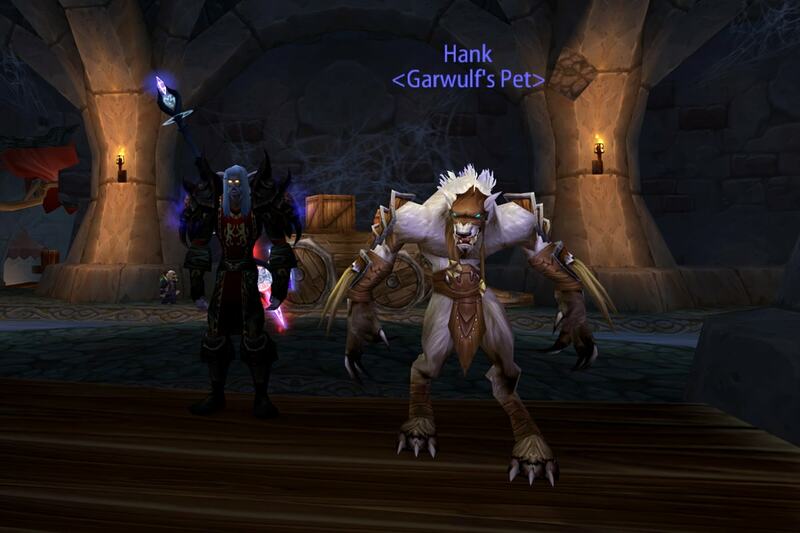 Some clever Hunter out there – an Orc Hunter, I think – came up with a way to time the tame just right so that he was able to begin the tame while Garwal was in his beast form, then ending the tame at the precise moment he transformed, thus successfully taming Garwal as a Worgen. I don’t remember exactly where I spotted this, but back then I was pretty active in keeping up on news, rumors, etc…unlike today. 😉 The second I found out that this was possible, I read up on the strategy and headed out to Howling Fjord on my werewolf taming mission. The tame itself was very tricky. Reason being, the tame had to complete at the exact moment that Garwal shifted. A second too soon, or too late, and you’d fail. It’s also important to remember that back in those days Tame Beast was on a very long cast timer compared to now, which gave mobs plenty of time to interrupt the taming. Another possible issue with this tame was that if you’d already completed the quest chain, this NPC would no longer be available to tame. 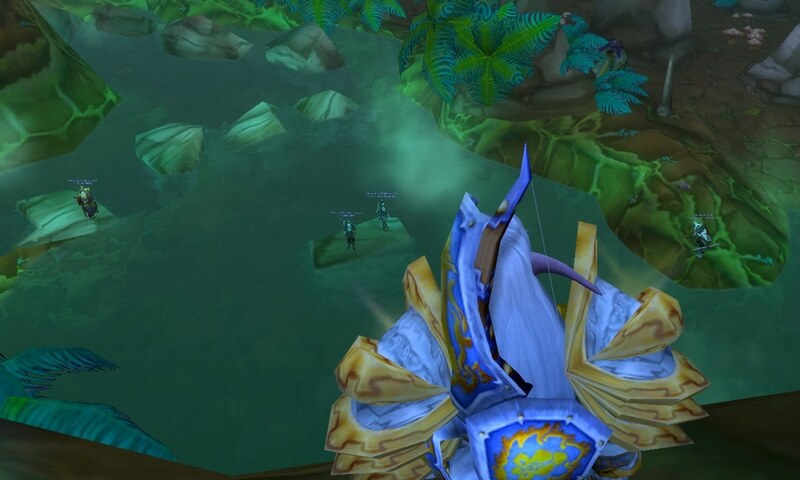 Lucky for me I’d started my Northrend journey in Borean Tundra and all but skipped over Howling Fjord, so the Garwal quest was still available to me. The successful taming strategy involved chipping away at his health, then hitting him with Wyvern Sting. The idea was to get him to around 40% or so, so that you could then hit him with Wyvern, wait for a bit, then start the tame so that it completes at the exact second that the Wyvern Sting poison gets applied – taking him to 50% and causing him to shift. If you timed it perfectly, Garwal would shift at the precise moment that the tame completed, allowing you to tame a werewolf. It was a huge exploit, and one I was pretty certain would be hotfixed quickly, so I never grew too attached to my Worgen pet, but it was fun while it lasted…which, if I remember correctly, was only about 3 or 4 days. If you want to read the original blog from about 5 years ago, as well as see a video of the actual taming, check out this post. If you want to see what Hank looked like with Big Red active, see this short video. The excitement of completing this tame successfully, along with the novelty of having a Big Bad Werewolf for a pet, made taming Garwal a most memorable WoW moment.